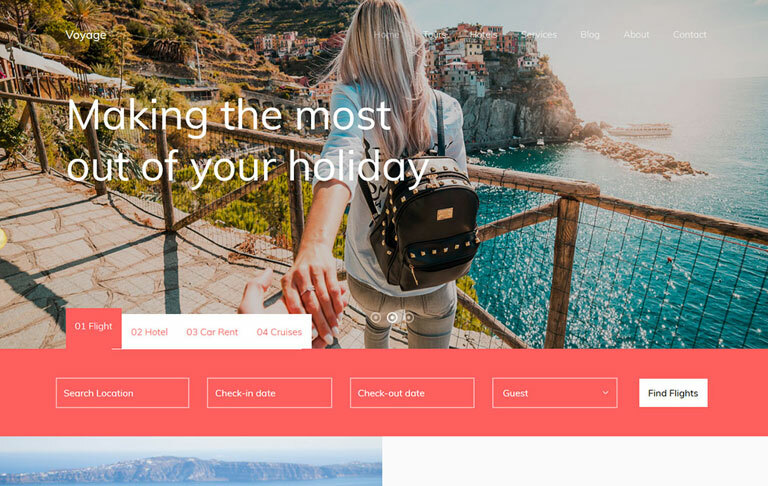 Voyage is a free HTML CSS website template for travel agency or tourism business websites. It has given important features which are full-screen slideshow, promotional video, showcase and web search option for flight, hotel, car rent and cruie search engine. Subscritpion form will help you collect potential customers’ emails. This template design is very interactive and intuitive to display your contents professionally. The packages you offer to your customers can be organized nicely because it comes with multi-page designs. Hope your business will grow well with this free template. 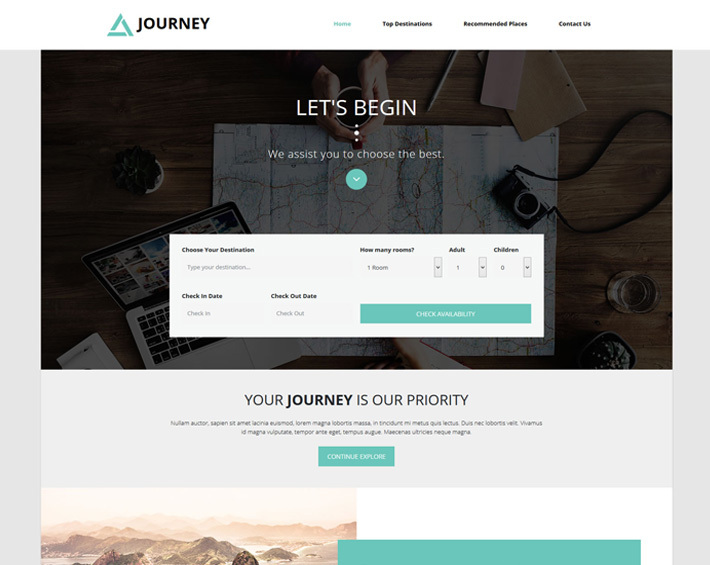 Journey is a clean and responsive HTML5 template professionally designed by templatemo.com for travel and tour website. It is one of the most highly downloaded web templates among templatemo.com’s free css boostrap templates. The inside design functions such as Check in Date/Check Out Date, Choose Your Destination and more are well-coded and ready for all web developers to use for their website development purposes. One of my favorite is the color skins which are soft and matched with the tour and journey web template theme idea. The html codes inside the template are neat, SEO friendly and 100% error free. Search engines such as Google prefers this kind of template to high-rank it in its search engine results. 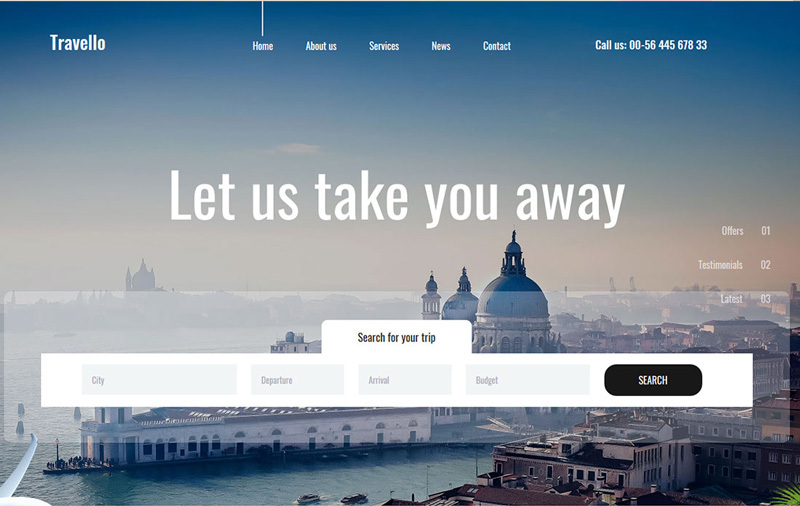 Travello is a free travel & tour website template suitable for companies and agencies for their hotel services, flight, cruise and tour, car rental and so on. It has a lot of cool web elements and animation effects. It comes with a traditional top bar navigation and in page navigation option. The Internet users can swift the sections easily in the homepage. It is easy to be customized to be your desired page and save a lot of your time and efforts. Again it is a neat, handy and free web css template for all kinds of web designers/webmasters as long as they keep the credit link at the footer. The designer has used Boostrap Framwork. Therefore, Travello template displays the contents smoothy on all devices such as smartphones, tablets and desktops. It will surely give an excellent impression for your businesses. 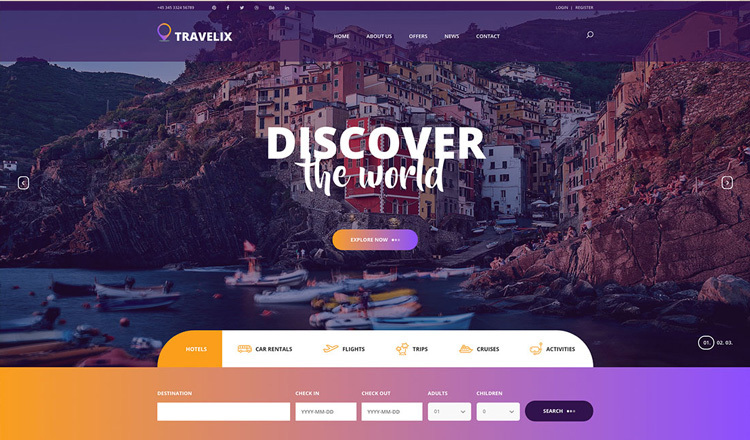 Travelix is a stylish and mobile-ready travel website template. It is free and best suitable for flight, trip, cruise and car rental business. Travelix has many fantastic HTML elements which are powerful and easy to customize.